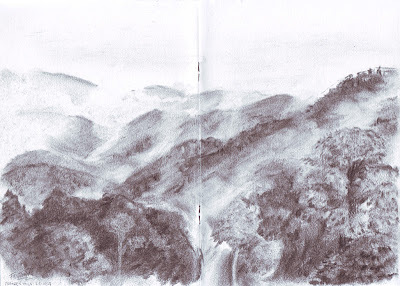 I did this charcoal drawing on a cold afternoon from the balcony of the apartment I was staying in Fraser's Hill. There were clouds on the hills, and I tried to capture them on my A4 drawing pad. I wasn't too impressed with the end result, but my friends and fine art teacher liked it. My teacher said it had "feeling" and had some semblance of a Chinese ink painting. So here it is!